I discovered free form embroidery not too long ago, and it's quickly becoming one of my favorite hobbies. I love the portability, the freedom, and of course the fact that it is darn near free. Why is everyone not doing this? Bats' mum visited over the long weekend, and unfortunately it rained about the whole time and we were stuck watching movies. I am unable to simply sit so I took the opportunity to finish the project I'm working on for my mom's birthday. Now I just need to find cute frames for them and they'll be all set. Does anyone know where I can get cute oval frames fairly inexpensively? I am having no luck. I've also been working on some new patterns, that will hopefully be for sale soon. 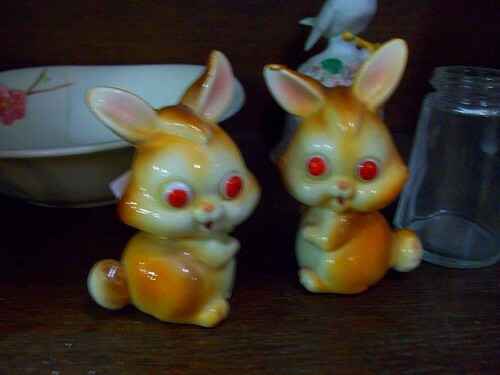 The first is a set of cryptozoology creatures. 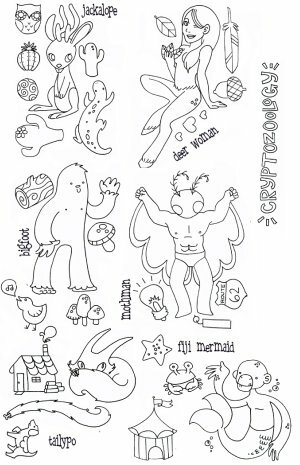 It includes Bigfoot, Fiji Mermaid, Deer Woman, Tailypo, Mothman and a jackalope. I think Tailypo is my favorite, but that's probaby because I had a book about him/it when I was little and spend several days creeping around saying "where is my TAILYPOOOOOOO?" Plus he has a tiny cabin of unspeakable horrors, so cute! Also, silly bugs in the hood. I've also been playing a bit with the Watchmen embroidery patterns. I have them all colored and will be selling prints in my Etsy shop if anyone is interested. There are teasers for all the others on my Flickr page. 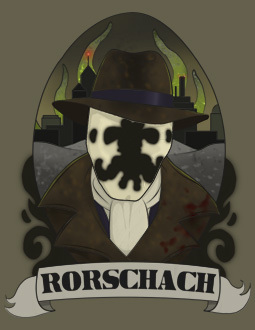 And speaking of the Watchmen embroidery, I have to share this awesome project by Allison. I think Rorschach holds the honor of being her very first embroidery project, wow! If anyone else has done anything with these I'd love to see it, please comment. * A lot of guys seem to be t-shirt collectors. If he has some that he doesn’t wear, but just can’t part with make him a t-shirt quilt (Ask first, obviously.) If he doesn’t have enough for that, a few t-shirt throw pillows might be nice. * Other types of blankets make great gifts too. 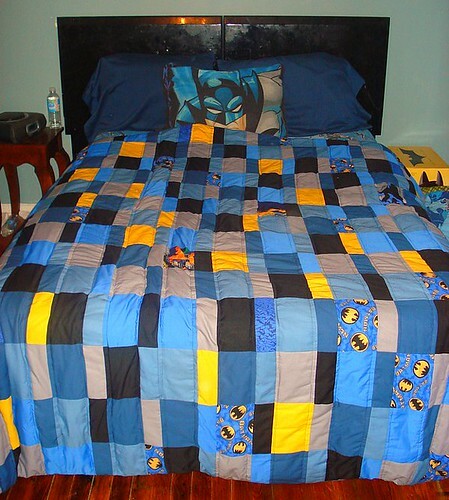 I made this Batman themed quilt for Bats last year. You can also make a fleece tie blanket, but I kind of prefer sewing the two pieces together instead. Just sew the pieces together and turn right side out and add some topstitching an inch or two in. This method also gives you the option on using fabrics that don’t work well for tie blankets like flannel, cotton, or fake fur. You can also add binding. Heather Bailey has an awesome tutorial for continuous quilt binding. 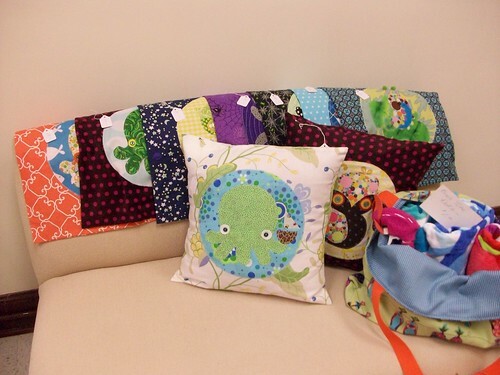 * Pillowcases are another easy and sweet project. You can make your own with this tutorial. Creature Comforts also has free download for a spiffy two pillow iron-on transfer. The two pillow/one picture thing could be a really neat idea to play with. * Make some Warhol-esque art for him. Of if you’re feeling ambitious, get rasterbating! * Does he need a snazzy place to chill? Head to the thrift shop and find a comfy chair to reupholster to fit his interests. The Cut Cloth blog has a primer for any beginners. If you’re not feeling that, how about a couple of bean bag chairs? * I’ve had success with handmade plush including Zartan, Hellboy, and Harley Quinn. Check out Softie Making for tips and tricks. 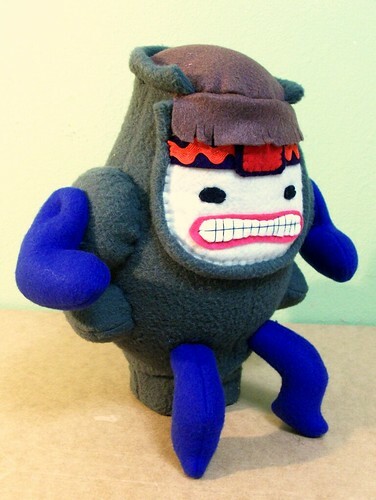 Revoluzzza shows us how to make a cute little monster plush that could easily be modified into an animal or robot. How about some sock buddies? If he’s stressed, there’s always the classic voodoo doll or dammit doll. These can of course be modified to look like the source of his annoyance (lazy coworkers, political figures, incompetent management, etc). Friday I posted lots of tutorials for things to wear. * Everyone needs stuff to carry their stuff. 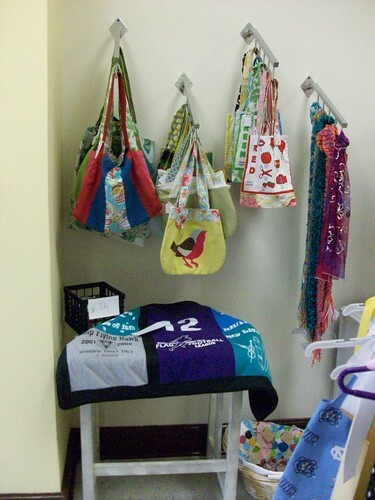 How about a personalized messanger bag? I made one for Bats for carrying toys when we go to the comic convention (see above). You can also try a duffel bag. If he’s a nerd, try this Domo-Kun backpack, or use the tutorial as a jumping off point. *If he’s a photographer, how about a personalized camera strap slipcover? *The nature lover might like a little terrarium for those times when he’s stuck indoors. Terrariums are cheap, can be made in pretty much any clear container, and there’s always the option of putting ridiculous plastic toys in it for giggles. * If he’s often sore, a hot/cold therapy pack would make a thoughtful gift. Along with back rubs, who doesn’t love back rubs? * A manly apron might be great for a guy who enjoys crafting or cooking. I made one for my dad to use while leatherworking. Just research what types of tools are used and add pockets and loops accordingly. These tutorials provide good jumping off points. Consider using vinyl or canvas for something more durable and easy to clean. Personalize it by lining it with a cotton print or adding a patch. * If he likes to keep his ideas and thoughts recorded, what about a journal? (If he’s the engineering sort, make sure to include graph paper!) The Long Thread and The Small Object both have lovely journal making tutorials. If you’re not into bookmaking, personalize a ready made journal. Border’s Books sells plain fabric journals for less than $10 and they are perfect to color with regular color pencils. The final installment is next. Edit: Links should be operational now. Today was the grand opening of Panache, and marked the first time I've had my things in an actual store. I'm kind of excited, and it's weird to walk into a store and see my things. It's a wee little independant store, but it's a good start and I'm happy. My pillows on a little sofa near the back. I still like the term "caterpillow", hee hee. A rack in the middle of the store. 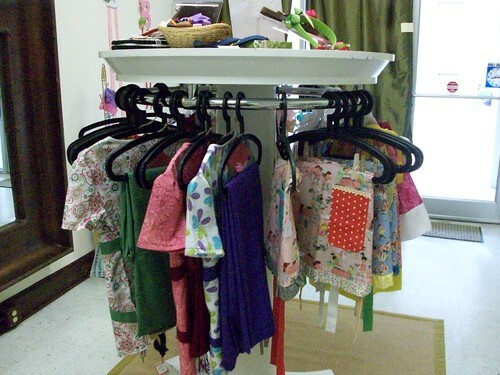 Those are my aprons hanging on the right. Some of my many, many purses. The shop owner actually bought two from me. Are they not the freakiest little things ever? 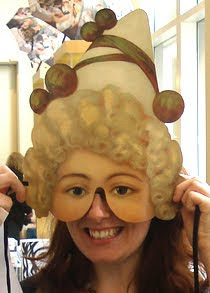 I sort of love them, and was sorely tempted to buy them just to hide around the house and scare the crap out of people. I did buy a pair of tiny green ceramic owls, which I need to take a picture of. With Bats’ birthday a few days ago, I was again faced with the difficult task of figuring our what the heck to make for a guy. I know it’s a pain for me, I figured it was a pain for other people. Hence this incredibly long list of links, tutorials, ideas, and inspiration. This ending up being kind of huge, so I’m splitting it up into three parts and posting one per day. No one wants to snuggle with a frigid boy. Why not make him a hat, gloves, or a scarf to keep him toasty? You can turn an old sweater into mittens and a hat, Simple Up shows you how. Instructables has a tutorial on how to sew a scoodie, which is a scarf/hood combo. Need a gift for a Firefly fan? Emisanboo on Crafster posted instructions for a Cunning Jayne hat. What about a Cylon hat? And if you’re not in the mood to sew/knit/crochet, Etsy seller Rachel’s Threads makes these awesome scarves from socks. 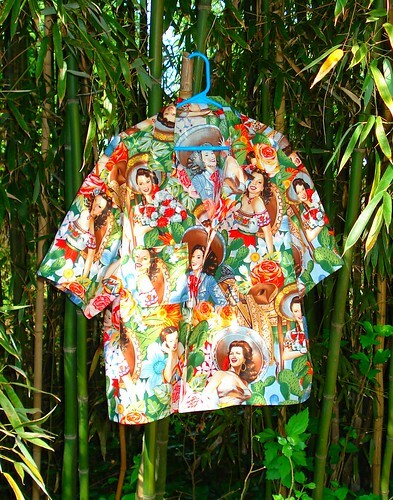 Know a guy who loves to express himself through his clothing? Try personalizing some for him. Craft Stylish shows how to reverse appliqué. The tutorial uses a tote bag, but this technique can easily be applied to clothing. 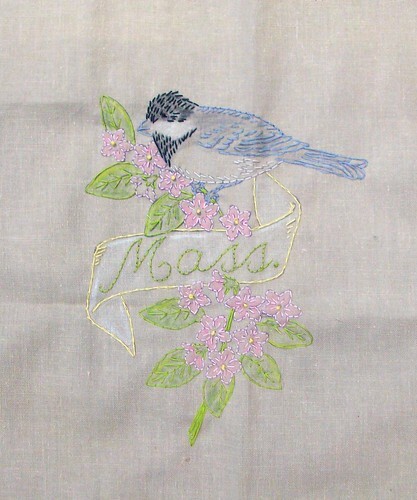 Looking for tips on traditional appliqué? Andrea Zuill has a great tutorial. You can also find tips on Whip Up. This idea is shown on a onesie, but it would be just as cute on an adult. LemonVerde has a great tutorial on how to do printing fabric. You can also head over to Spoonflower and print your very own designs on fabric for something totally personal. Cut Out and Keep has a great tutorial on how to transfer images with just turpentine. If he prefers to express himself with his footwear, how about a pair of custom painted sneakers? Canvas sneakers can be had fairly cheaply, and all you need is some paint. If you’re not an artist, find images you like and transfer then using transfer paper (this can be found at most fabric stores). Check out Flickr for more ideas. * Keep his feet comfy with handmade slippers. The Sew Green blog offers a tutorial for slippers made from recycled blankets. Here’s a tutorial for crochet slippers. Here’s a big list of links and tutorials. * Purl Bee has a great tutorial on how to make a little boys tie. I imagine this could be easily adjusted to make adult ties as well. * Do his pants fall down? How about a nifty patchwork belt? * Pajama pants and boxers are pretty standard guy gifts and very easy to sew. Just find a pattern at your local fabric store. * Fabric cuffs might be a nice accessory. Just cut two pieces that measure about 3” wide by the wrist measurement plus about 2” (you need a little for seam allowances and overlap). 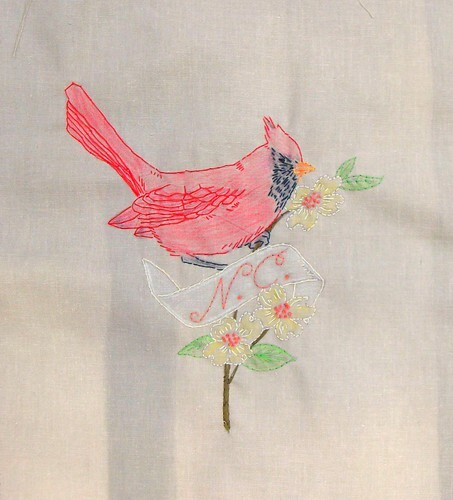 Decorate how you like by embroidering, printing, appliqué, etc. Put your two pieces right sides together and stitch almost all the way around, leaving a gap for turning. Turn, press, and do a little edge stitch for stability about ¼” from the edge. Then just sew on some snaps or Velcro. The most important thing is to think about what he'd really like. Try to find fabric with his favorite characters, sports teams, foods, whatever. Pay attention to what he needs, what makes him happy, and how he expresses himself. I make toys and plush for Bats pretty often because he loves collectibles and displays tonsof toys and statues.